Mubarak is on his way back to Egypt. Well done, folks. It’s amazing how much mileage we can… all… squeeze… out… of a meeting that is notable for its general lack of newsworthiness. If I had to score this one, I hate to say it, but I would give the edge to the Egyptians. I think the Obama people got snookered by the Middle East. President Hosni Mubarak came to the White House, demonstrating he is back and bilateral relations are on track without returning the favor to his host. It is true that everything—nuclear proliferation, terrorism, Iran, Iraq, Yemen, Somalia, Sudan, democracy (or lack thereof), and the Arab-Israeli conflict—was on the table, but it seems President Obama did not get what he needed/wanted most: A commitment from Mubarak for an Arab gesture toward Israel. The prevailing discourse on the Arab-Israeli conflict in the nation’s capital suggests that some sort of positive signal from the Arab world to Israel will make a settlement freeze more tenable to average Israelis and encourage them to take the hard steps that lie ahead. Mubarak wasn’t buying it and there is little reason to believe that he would. Egyptians argue that Cairo has a peace agreement with Israel, there is security cooperation between the two countries, and the Egyptian head of Intelligence spends a great deal of time on issues important to Israel. Why is an additional gesture necessary? More broadly, the Arab world points to the Arab Peace Initiative that then-Crown Prince Abdallah tabled in 2002, which promised Israel normalization of relations once there is a settlement to the Palestinian-Israeli conflict, as the most important gesture to the Israelis. If that is not incentive enough for the Israelis to negotiate in good faith, what is? So we are left with platitudes about progress and the need for all parties to do more to create an environment for peace. I sincerely hope no one left the Vineyard for this snoozer. In all seriousness, the result of the meeting ups the ante for Obama’s planned big statement on Middle East peace. Perhaps if he throws down the gauntlet in a big forum, his international prestige will compel the parties to take the necessary steps toward peace. It is hard not believe, however, that Obama just learned a very important lesson about the limits of American power to get friendly governments to do things Washington wants. The other items on the agenda seemed secondary, but I was not there so I don’t know for sure. If Abdel Monem Said’s Washington Post piece is any guide, the Egyptian delegation was, among other things, seeking to enlighten its American counterpart on problems in Somalia, Sudan, and Yemen. That’s all well and good. Thanks for putting it on our radar screen. Yet, what are the Egyptians bringing to the table to help Washington deal with these very difficult problems? If Egypt’s response to the problem of piracy, which directly affects Egypt where it counts—in Suez Canal tolls—is any guide, Cairo does not plan on offering very much. Rather than deploy its navy to ensure safe passage in the Gulf of Aden, which leads to the Red Sea and the Canal, Egypt suggested the establishment of a regional information center on piracy, and Mubarak proposed that merchant ships arm themselves with heavy artillery to deal with the problem. Both President Obama and the Secretary of State Clinton confirmed that they raised human rights and reform issues, which is a good thing, but I am skeptical that the United States is going to get very far with Mubarak. It seems to me that given the nature of the regime, it’s going to be awfully hard for opposition groups to dislodge Mubarak or any of his likely successors even with Washington’s help. I am channeling Gramsci here. It’s a fantasy to believe that civil society groups can disarm the Egyptian gendarme state. It’s true that Mubarak relies on coercion, the least efficient means of political control, which suggests that he is vulnerable to counter-narratives. Still, those alternative accounts of Egypt exist, whether they are liberal, Islamist, leftist, neo-Nasserist, and yet Mubarak seems secure. Yes, I know this is a generational issue. That’s why I think it was good thing that President Obama and his Secretary of State raised the issue of reform even if they are intent on treating the relationship more broadly than their predecessors. In the end, I guess the Obama administration is more Rumsfeldian than it may like to admit. You deal with the Egypt you have, not the one you want. I agree with Steve Cook’s analysis of the Mubarak visit, but I disagree with his analysis of what effect U.S. actions can have on domestic Egyptian politics. First, the visit. Indeed, it seems that Mubarak got exactly what he wanted: face time with President Obama before he finalized his peace initiative, and a warm visit to show all that Mubarak is back in Washington’s good books. And it is hard to see that Obama got anything. Mubarak repeated just what Obama heard from Saudi King Abdullah: the Arabs went down the road of starting to normalize relations with Israel during the peace process of the 1990s, only to have the whole venture collapse. So now they are not willing to make even limited gestures until Israel freezes settlements and restarts talks with Palestinians. Egypt will plug away at a Palestinian reconciliation and perhaps the recent Fatah conference offers a small glimmer of hope, but frankly Egypt has not accomplished much in two years of efforts and cannot promise success now. Second, what can and should the Obama administration do regarding human rights and democracy in Egypt? Here I disagree with Steve’s analysis, which I view as too static. Of course we have to deal with the Egypt we have, but we also have to keep an eye on the Egypt that is coming. Mubarak won’t be there forever, and we should be encouraging a gradual opening of political participation and improvement in human rights practices now and for the post-Mubarak era. It’s a mistake to keep this entire relationship concentrated on a handful of Egyptians at the top of the pyramid. True, Mubarak is unlikely to do much, but he has shown the capacity to make some changes when pressed (opening up the presidency to popular election, allowing the emergence of independent media) and in any case it is important for the United States to signal to all concerned what we are hoping for in the post-Mubarak era. Civil society will not overturn the regime, but it can generate badly needed ideas for change and enlarge the field of players for a more participatory era. 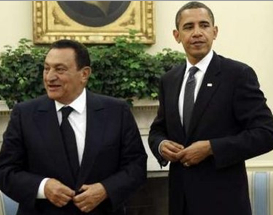 What did Obama and Clinton raise with Mubarak regarding democratization and human rights during the visit? Probably not much, but there was a small hint in what Mubarak said after his meeting with Obama: “And I told to President Obama very frankly and very friendly that I have entered into the [2005 presidential] elections on a platform that included reforms, and therefore we have started to implement some of it and we still have two more years to implement it.” What Mubarak seems to be implying here is that Obama raised with him his unfulfilled 2005 pledge to lift the state of emergency in Egypt that has been in place since 1981. That would accord with the Obama approach as I understand it, which is to raise with Mubarak only whatever reform promises he has already made, meaning that the U.S. strategy will be shaped by Mubarak himself rather than by other elements in Egypt (civil society groups, political parties, etc). I have been thinking lately that, when it comes to democracy in the Middle East, perhaps President Bush and his team can be accused of having had too much imagination about how things could be different, or of having expected too much to happen too quickly. But so far on the democracy issue, the Obama team has shown no imagination whatsoever. Michele Dunne is a member of MESH. The Obama administration has been working from day one to climb out of the hole dug for the United States internationally by the Bush administration. As UN Ambassador Susan Rice put it in a major address last week, “in the U.S. Government [we] are reshaping and renewing American leadership for a very different era.… The United States is back.” Mubarak’s words and his very presence in Washington after a five-year boycott is symbolic, to the Obama administration and to the Arab world, of that renewed legitimacy. How valuable that reciprocity is, of course, depends on how deep you think the credibility hole is for the United States in the Middle East, and how valuable a commodity you think credibility is in international politics. But, if you are President Obama, and you are investing heavily in the Middle East peace process—especially if you are going to, as Steven put it, “throw down the gauntlet in a big forum”—then you probably want all the regional credibility you can get, even from somewhat impaired regional leaders like Mubarak. Personally, I am not convinced that a public pronouncement from Washington this fall, whether it is in the form of an American plan outlining a new process or American parameters for a negotiated solution, will take us very far down the path to a viable or effective Middle East peace process. The obstacles are much closer to the ground: the lack of Palestinian political consensus and the lack of Israeli political will. Efforts by third parties (like those much-sought-after gestures from Arab states) can help to work on the latter, but nothing international actors do from outside (short of trusteeship) can really work on the former. Negotiating a deal with a rump Palestinian Authority while Hamas stews in Gaza is unlikely to bring security to Israelis, statehood to Palestinians, or peace to either side. Trying to do so only increases the incentive for spoilers (in Gaza and outside) to do their bloody worst. The third party with the greatest capacity to change this equation is Israel—and that issue (I mean the Gaza issue), so far, has not been a subject of much discussion between the United States and Israel. Israel’s policies on access to/from Gaza and on military operations in/around Gaza are the most influential variables in altering Fatah and Hamas incentives to cut a deal for cooperation. This is not to say that Israel could ensure the success of Palestinian unity talks if it chose; but without Israeli and Egyptian buy-in, a deal that re-opens the Gaza passages and re-introduces the PA into Gaza is not possible. It’s worth exploring what such a deal would look like, how it could be packaged, and what it would mean. Even with Israeli help, factionalism might still override the effort to rebuild a Palestinian leadership with enough legitimacy and capacity to govern and to negotiate effectively with Israel. And there is a real risk that such a deal might entrench Hamas in Gaza (not that they appear to be fading now). Still, we know the consequences of not exploring this risky and uncertain path: without a Fatah-Hamas deal that reestablishes the PA’s legitimate authority and reintegrates Gaza and the West Bank, there will be no change on the ground in Gaza—and without a change in the status quo in Gaza, a new Israeli military operation is only a matter of time, as myriad Israeli politicians and security professionals will tell you. A new Israeli military operation in Gaza will inevitably torpedo whatever lackluster peace process Washington has managed to gin up in the meantime, and bring us instantly back to where we were on the day President Obama took office. So, I suspect, the road to Arab-Israeli peacemaking leads less through Cairo or through Washington, so much as through Jerusalem. Let’s hope that Ramadan and time on the Vineyard don’t prevent the Arab and American governments alike from reaching out to Israel.